In this section, we explain further commonly needed editing operation tools found in the context menus that appear when RIGHT CLICKing in the process Output track. The Select Menu (shown right) has two sub-options. Deselect All - will deselect the currently selected items from being adjusted together. 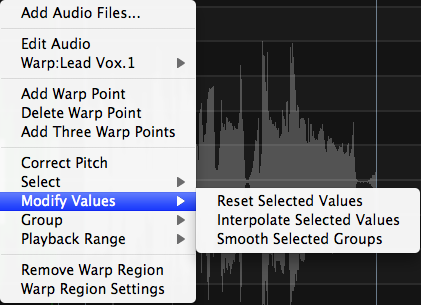 The Modify Values Menu (shown right) has three sub-options. Reset Selected Values - Will restore all the values to their Original settings (before any editing). This is very useful if editing is not working and the user wishes to start again or just remove all edits. Interpolate Selected Values - change values into a straight line between the value at the start of the selection to the value at the end of the selection. 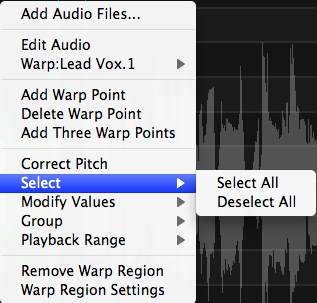 Mainly used to achieve a special pitch transition effect. Smooth Selected Groups - modify the pitch display at the boundaries of pitch blocks to smooth out any visual discontinuities between blocks of pitch that might appear when blocks are moved up and down. This can sometimes help modified signals sound better. 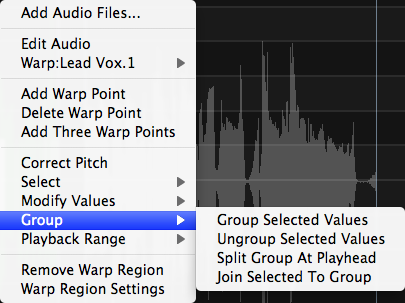 The Group Menu (shown right) has four sub-options for making "permanent" modifications to values. Group Selected Values - will merge all individual values and pitch (or other) note block values into a single block of values. Ungroup Selected Values - This will separate all selected blocks and value measurements into single point values that can be individually modified. Split Group at Playhead - will separate a block or range of selected values into two blocks of values at the position of the Playhead. This can be useful for dividing one note into separate notes for more detailed adjustment. Join Selected to Group - will merge all selected blocks into one block for manipulation. The Playback Range Menu (shown right) has 2 sub-options for using the Playback Range in specifying an action. Selected to Play Range - Will create a Playback Range set to the length of the selected items. This is useful for quickly setting up a looped audition range while adjusting values and listening to changes with each adjustment. 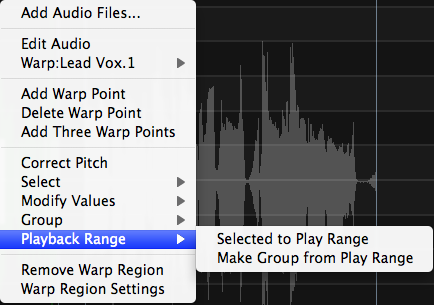 Make Group from Play Range - will create a single group from all blocks in the time range specified by a Playback Range.